Yosemite Forum • View topic - So what and who are the Yosemite area Walla Indians? So what and who are the Yosemite area Walla Indians? 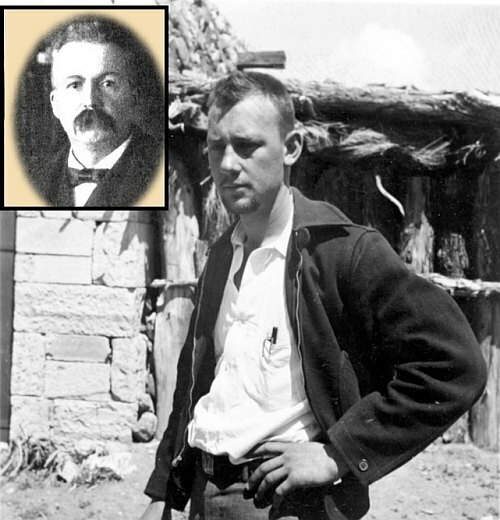 C. Hart Merriam (insert) and Robert F. Heizer. Heizer compiled Merriam's works and documented Walla Indians of the Central California foothills region, which includes Yosemite. If you look at early books of the Central California area just outside of Yosemite you might run into a name of a tribe called "Walla" or a variation of that name. But if you look at recent ethnography of the area you will see that name completely gone. We know that area was Miwok and further south Yokut, but who are the Wallas? There were only a handful of Indians in the area left after they were decimated by miners so what happened to them...did they just disappear into thin air, or did they become the Southern Sierra Miwuks? To emphasize that the Miwoks were the indigenous people of Yosemite Valley the Park and the Yosemite Association use the writings of C. Hart Merriam, who was not a local. Merriam would travel for a day or week every other year into the area and meet with Indians living on the western foothills of the Sierra Nevada located in Central California. Yosemite Park Service heavily uses Merriam to push the myth of the Southern Sierra Miwuks of Mariposa as the original Indian people of Yosemite Valley, but the Park has not done their research. In the 1930’s another anthropologist living in Central California, named Frank Latta, spoke to and told Merriam he was incorrect in his early findings about the Miwok of the area. Merriam conceded that his information was incorrect when identifying and classifying Yokut tales as Miwok legends. This leads to the question was Merriam incorrect in the rest of his writings about the fabled Yosemite Miwoks? By the time Merriam had entered the western foothills of Central California around Mariposa, Stanislaus, Merced, Madera and Tuolumne counties there were only a few hundred Indians who had survived disease, murder and assimilation. Meaning the remaining Indians could be easily documented. When researching the early history of Mariposa and the surrounding area the name “Walla” kept appearing. The Indians of the area were regularly referred by three names, the standard “Indian”, or “Digger”, but often times “Walla”. The term Digger Indian was a general derogatory name given to the majority of California or Western Indians by white people to describe them. 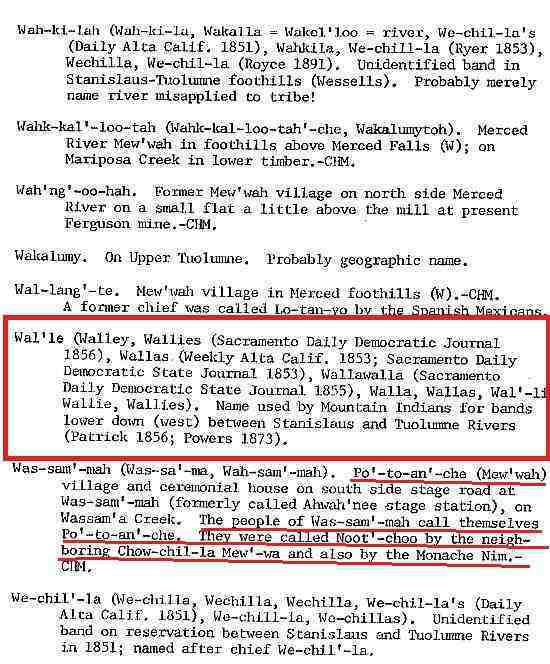 But the interesting name for the early Miwok people of Mariposa and the surrounding area was “Walla” or forms of that name. Since there were only less than a hundred “Walla” living in the area by the time of C. Hart Merriam’s earliest 1900 interviews, who were they? Who were these Walla Indians now claiming to be Yosemite Miwoks or Southern Sierra Miwuks? 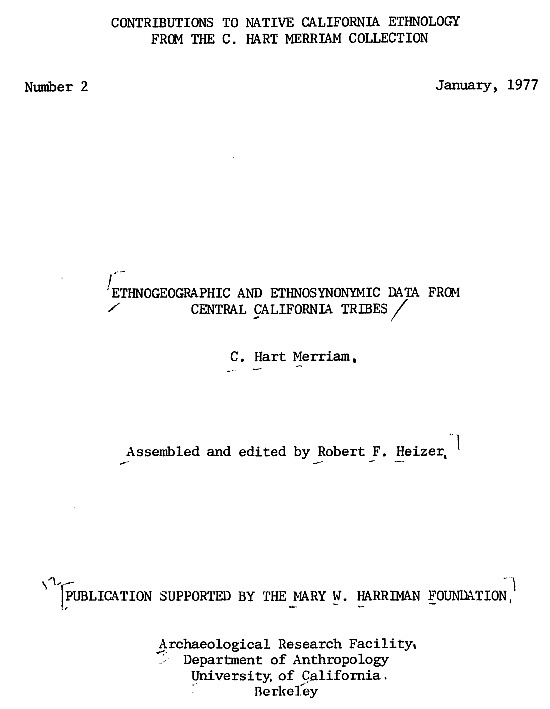 Merriam even documents these Walla Indians in his notes and reports which were compiled by noted California Indian ethnologist Robert F. Heizer in “Ethnogeographic and Ethnosynonymic Data from Central California Tribes; C. Hart Merriam” published by the Dept. of Anthropology, University of Berkeley California in 1997. Page 157 of Merriam’s and Heizer’s book documents a tribe called the Wal’le, Walley, Wallies, WallaWalla, which Merriam and others wrote lived between the Stanislaus and the Tuolumne River up to 1873. Merriam and Heizer document Walla Indians, but where did they go? This appears to be the Miwok Indians in the area because there were no other tribes in the western Sierra Nevada foothills but them. Note all tribes on the page start with “Wah-“. The rest of the language is not Washoe and the tribe of that area spoke a language that is similar to the Southern Sierra Miwuks. There were Paiutes and Washoe Indians living high up in the Sierras. Both Paiutes and Washoes speak different languages then the Miwoks, but what happened to the Wallas? Did they just vanish into thin air? And where did they come from and where did they go? *Note page 157 says that Chowchillas, who are not Miwuks, and Monos call the Potoanche (Southern Sierra Miwuks) the “Noot-choo” (Nutchus). This was the same tribe who aided the Mariposa Battaion in hunting down and capturing Chief Tenaya and the original Indians of Yosemite, the Ahwahneechee, which caused the death of Tenaya's son. Proving that they were not the original indigenous Indians of Yosemite Valley as has been falsely claimed.